Clay is a 100% natural material, ideal for kid-sized hands and great for us adults too ! Childhood memories just start flooding back as soon as you get your hands on the stuff ! Easy to shape, smooth, work with your hands or with tools from the kitchen or a play dough-style set. Your clay needs to be kept in a damp cloth whilst you're working, and then all together in a plastic bag ready for the next time. Baking : Only really necessary for clay models with very delicate parts that can crack if the clay's not baked. The baking can't be done in a normal oven because of the very high temperatures needed. Contact a local arts and crafts association to find out where you can bake your models. 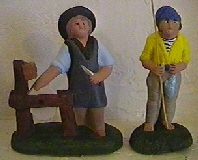 The models shown here, created for a Christmas creche in the south of France, were dried in the open air. Paint and varnish also help stop the clay crumbling. The wall is made of individually made 'bricks'. The boar, thanks to its heavy-set form, is easy to model by hand. For the bridge and the well, the stones are drawn in with a fine blade. Where can you buy clay? In craft outlets you can find different colors and kinds of clay. For larger quantities (for clubs etc), the best idea is to get it straight from tile-manufacturers. For smaller amounts, just to try it out or when working on small objects with the kids, you can buy just about everywhere little blocks of self-hardening clay. This material is however, less easy and not so pleasant to work with, but it's good for repairing objects in clay or salt dough. These decorations were made using self-hardening clay. The letters are shaped and smoothed.The supporting base is created from wire from which individual strands were taken, coiled as in a spring, and then the letters fixed on top. 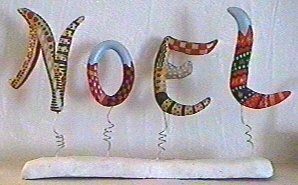 Two letters are spray-painted gold, then all four letters are painted using a very fine brush, all in very festive colors! The makers of Christmas creches often make nativity figures ready-to-paint. It really is great fun being able to decorate your own figures!Getting the painting, the gilding just right, using a very fine brush, and at the end of two hour's work (in my case, at least!) you have a beautiful figure to display and enjoy each Christmas. A magnificent nativity creche, entirely made from clay by a master-mason from the town of Saint Chamas.